Yesterday, we posted a piece on the importance of showing solidarity with the people of Gaza, by participating in the Palestinian Boycott, Divestment (BDS) and Sanctions Campaign against Israel. 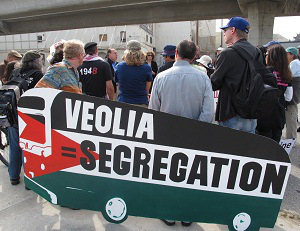 We have also posted in the past stories about the multinational company Veolia as being one of the major companies being targeted by the BDS Campaign and that Veolia operates in Grand Rapids. 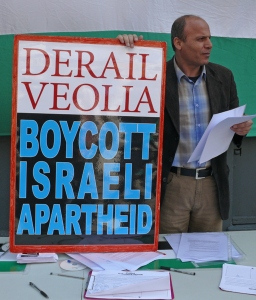 Veolia is currently being targeted by numerous solidarity groups because of a contract they have with the State of Israel for a light rail system. This light rail system supports Israeli Apartheid, mostly because it only provides transportation for Israelis and is designed to compliment the Israeli Separation Wall, which has been condemned by human rights groups around the world. First, the City of Grand Rapids contracts with Veolia, which runs the steam-heating system for much of the downtown area. Veolia Energy serves the business district with centrally-produced steam. Customers include: hospitals; college campuses; sports arena and exhibition center; prestigious office buildings and retail store fronts; city, state and county government facilities; private apartment buildings and arts and culture centers. People could organize a campaign to get the City of Grand Rapids to discontinue that contract with Veolia, since Veolia profits from the Israeli occupation of Palestinian land. One could also argue that this would not be an unprecedented move, since the City of Grand Rapids participated in a Divestment Campaign in the 1980s and removed its money from Old Kent Bank, which was doing business in Apartheid South Africa. Second, Veolia’s downtown heating system also has a contract with GVSU to heat their downtown campus. In this case, a student, faculty or staff association could begin a campaign to get the University to end that contract and join dozens of other campuses across the country who are participating in the Palestinian BDS Campaign against Israel. Anyone interested in either campaign, please let us know as we will help publicize such a campaign and take part in it as a demonstration of solidarity with the people of Gaza.